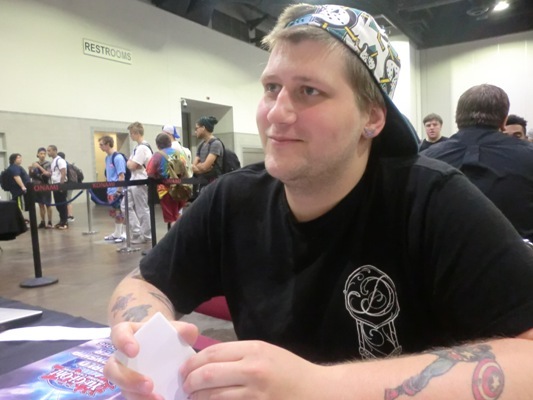 Erik Goodwin and Malik Dancy both made it to Day 2 of YCS Providence with 7-1 records. Now, they’re Dueling their hardest to secure a spot in the Top 32. Each Duelist will need at least one more victory for a shot at making the Top 32 cut, but each one will be aiming to win both of the last two Swiss Rounds to guarantee that Top 32 spot. Erik Goodwin is using a Monarch Deck without an Extra Deck in order to capitalize on the effect of Domain of the True Monarchs. 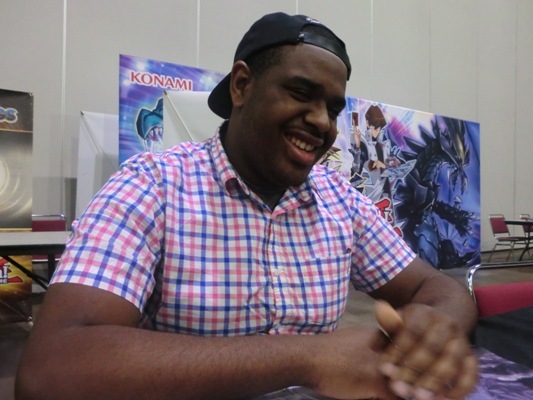 Malik Dancy is using a Kozmo Deck featuring 2 copies of Kozmoll Dark Lady, 2 copies of Kozmo Landwalker, and 1 copy of Fire King Island from Shining Victories. Dancy’s inclusion of one copy of Fire King Island and one copy of Fire King Avatar Garunix in his Kozmo Deck allows him to destroy the Kozmo monsters in his hand to trigger their effects with Fire King Island. Will Goodwin’s Monarchs prevail over Dancy’s Kozmos? We’re about to find out – it’s time to Duel! Dancy won the die roll and chose to go first. He activated Terraforming to add Kozmotown from his Deck to his hand and then activated Kozmotown. Next, he used Kozmotown’s effect to shuffle Kozmo Tincan from his hand into his Deck and draw a card. He Summoned another Tincan next, and entered his End Phase. He paid 500 Life Points to reveal Kozmo Dark Destroyer, Kozmo Landwalker, and Kozmo Sliprider from his Deck with its effect, and randomly added Sliprider to his hand while sending the other 2 cards to his Graveyard. He banished Tincan to Special Summon Kozmoll Dark Lady from his hand before play passed to Goodwin. Goodwin opened up with Edea the Heavenly Squire, Super Quantum Red Layer, Domain of the True Monarchs, Tenacity of the Monarchs, and 2 copies of The Monarchs Stormforth. 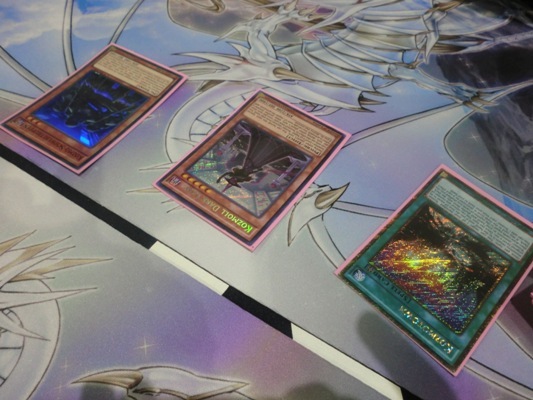 He activated The Monarchs Stormforth and Tributed Dancy’s Dark Lady to Summon Super Quantum Red Layer from his hand. He attacked directly and then passed his turn. Dancy returned Tincan to his hand by giving up 100 Life Points with Kozmotown and then shuffled Sliprider and Kozmo Strawman from his hand into his Deck to draw 2 cards with Kozmotown. Next, he Normal Summoned Kozmo Soartroopers and paid 1000 Life Points to Special Summon Kozmoll Dark Lady from his Graveyard. He attacked Red Layer with Dark Lady to destroy it and then attacked directly with Soartroopers. Goodwin drew Vanity’s Emptiness. He Set Edea, Vanity’s Emptiness, and Tenacity of the Monarchs before passing his turn. Dancy activated Terraforming to add Fire King Island from his Deck to his hand and then used Kozmotown’s effect to shuffle Tincan from his hand into his Deck and draw a card. Dark Lady attacked and destroyed Goodwin’s face-down Edea, and then Soartroopers attacked Goodwin directly. Goodwin drew another copy of Tenacity of the Monarchs and then passed his turn. Dancy used the effect of his Kozmotown to shuffle Kozmo Strawman from his hand into his Deck and draw a new card. He attacked directly with Dark Lady and Soartroopers before passing his turn. Goodwin drew The Prime Monarch and passed. Dancy attacked directly with Soartroopers and Dark Lady, wiping out Goodwin’s remaining Life Points! Malik Dancy capitalizes on Erik Goodwin’s failure to draw a Monarch in order to take a quick victory in Duel 1! Goodwin opened up Duel 2 with Maxx “C”, Eidos the Underworld Squire, Tenacity of the Monarchs, The Monarchs Stormforth, and Pantheism of the Monarchs. He activated Pantheism by discarding The Monarchs Stormforth to draw Erebus the Underworld Monarch and Edea the Heavenly Squire. He Summoned Edea and activated its effect to Special Summon Eidos from his Deck, and then banished Pantheism from his Graveyard to reveal Escalation of the Monarchs, Return of the Monarchs, and March of the Monarchs from his Deck. Dancy added Return of the Monarchs to Goodwin’s hand, and Goodwin shuffled the other 2 cards back into his Deck. Next, he activated Return of the Monarchs and activated Tenacity of the Monarchs by revealing Erebus. He added March of the Monarchs to his hand and activated it. He Tributed Eidos and Edea to Summon Erebus the Underworld Monarch and activated its effect, as well as the effect of Return of the Monarchs. He sent The Prime Monarch and Frost Blast of the Monarch to his Graveyard with Erebus’s effect to shuffle a card from Dancy’s hand into his Deck, and used the effect of Return of the Monarchs to add Ehther the Heavenly Monarch from his Deck to his hand. He banished The Monarchs Stormforth from his Graveyard to Special Summon The Prime Monarch to his field before ending his turn. Dancy drew a card and immediately conceded, completely overwhelmed by Goodwin’s field. 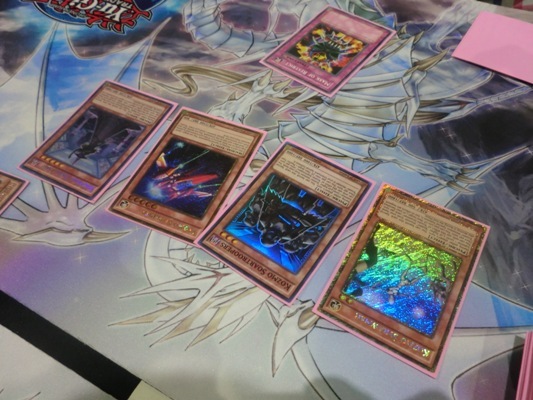 Dancy started off Duel 3 by Setting 2 cards to his back row and Summoning Kozmo Strawman. He entered his End Phase and then activated Emergency Teleport from his hand to Special Summon Kozmo Tincan from his Deck. He paid 500 Life Points to activate his Tincan’s effect, revealing Kozmo Dark Destroyer, Kozmo Sliprider, and Kozmo Soartroopers from his Deck. He randomly added Soartroopers to his hand and sent the other 2 cards to his Graveyard. He banished Tincan from his field due to the effect of Emergency Teleport and play passed to Goodwin. Goodwin opened up Duel 3 with Edea the Heavenly Squire, Escalation of the Monarchs, Battle Fader, Trap Stun, March of the Monarchs, and Ehther the Heavenly Monarch. He Summoned Edea and activated its effect to Special Summon Eidos from his Deck, but Dancy flipped Mask of Restrict to prevent Tribute Summoning. Goodwin attacked Strawman with Edea to destroy it and inflict 300 points of damage to Dancy. Goodwin Set Trap Stun and Escalation of the Monarchs, activated March of the Monarchs, and then ended his turn. 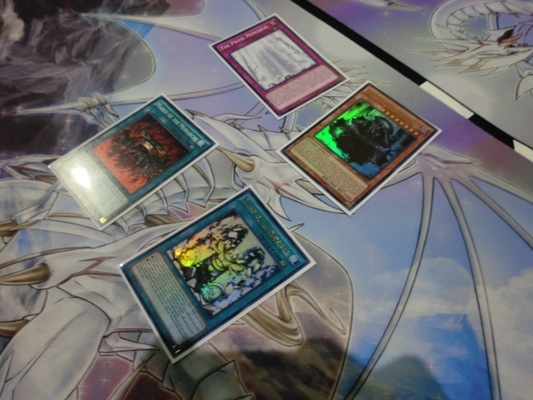 In his End Phase, Dancy activated Call of the Haunted to Special Summon Kozmo Dark Destroyer from his Graveyard and used its effect to have it destroy itself. He banished Kozmo Dark Destroyer from his Graveyard to Special Summon Sliprider from his Deck and then used Sliprider’s effect to destroy Goodwin’s face-down Trap Stun. Dancy Summoned Kozmo Soartroopers and then paid 1000 Life Points to activate its effect and Special Summon Kozmo Strawman from his Graveyard. Next, he paid 500 Life Points to use Strawman’s effect and Special Summon Kozmo Dark Destroyer from his Banished Zone. Soartroopers attacked and destroyed Edea, Sliprider attacked and destroyed Eidos, and then direct attacks from Strawman and Kozmo Dark Destroyer dropped Goodwin down to 4300 Life Points. In the End Phase, Dancy’s Kozmo Dark Destroyer was destroyed, and he banished it from his Graveyard to Special Summon Kozmoll Dark Lady from his Deck. Goodwin drew Maxx “C” and conceded, overwhelmed by Dancy’s monsters. Malik Dancy advances with an 8-1 record!